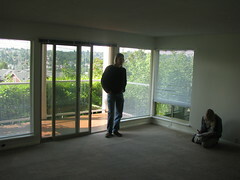 Sarah, Paff and I looked at apartments in Seattle yesterday. Sarah had done a lot of online research and arranged for tours. One stood head and shoulders above the rest. It was our top choice before we even visited; touring it just cemented its position. Now we just have to wait to wait for our application to go through. It's a little apartment in Fremont, hidden on a back road but right next to Fremont Avenue. A ten minute walk (if that) down the hill and you're in the bustling center of the neighborhood. 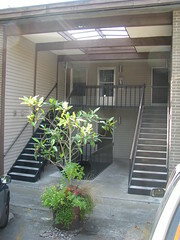 It has a beautiful view over lower Fremont and the canal, and is surrounded by trees. When we were doing the research, I compiled the apartments Sarah had found onto a Google Map. Paff reviewed it and determined that they needed easy handles for reference, so he tacked on common first names to each. I added a last name based on their neighborhood for easily finding them in the list. When Sarah found a second batch of apartments, she gave them a collection of slightly less common first names: Jezebel, Erasmus, Tabitha, etc. Thus was Jezebel Fremont named. She has a fireplace. A dishwasher, washer and dryer, garbage disposal. She allows cats. She is a 4 mile walk to Pike Place, and much less than that to Aaron and Soren.